What Causes Crown Molding to Separate From Walls? Crown molding ornamentation dates back to the architecture of the Renaissance. It provides a decorative touch to the area where walls and ceilings meet. Molding can last a long time and provides value to a home but may begin to separate from the wall after installation for a variety of reasons. 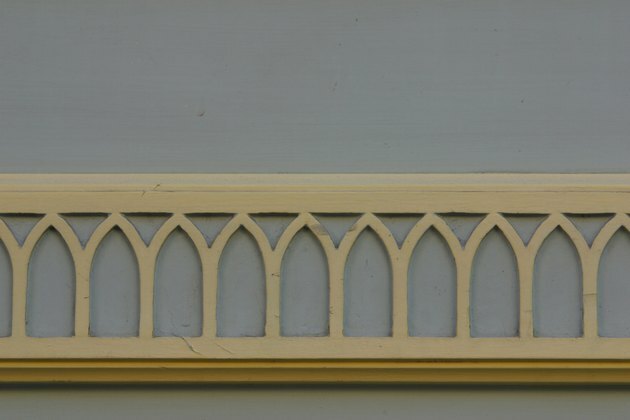 Changes in temperature can cause decorative molding to separate from the wall. Most crown molding is pre-shaped and sometimes pre-painted. It is generally made from material such as solid wood, plaster, ultralight medium-density fiberboard (MDF) made from resins and sawdust, polyurethane or PVC . Humidity and extreme changes in temperature can lead to molding beginning to detach from walls or the ceiling. Gaps and cracks develop, making the crown molding separate from the wall. Nails and adhesive caulk are no match for temperature-related separation and moisture. The root cause of the problem stems from the contraction or warping of ceiling trusses, the beams that make up structural support of the roof of a house. When the trusses contract, the ceiling lifts and pulls up the crown molding creating separation, gaps or cracks. While wood crown molding can be a stunning and natural way to add beauty to your house, it is also susceptible to termites and bugs including certain types of beetles. The pests infest the wood and begin destruction at the larval stage and can eat right through the adhesive and caulk of the molding. If your house has water damage from floodwaters or leaks, the wood beams in your house may begin to rot or change position which can also affect crown molding. For wood crown moldings, you can use canned wood filler to fill in small gaps. If the damage is from pests, remove the infested material and replace it with treated wood. You can consult a professional and have the wood treated with pesticide. If you do not want to worry about insects, use plaster, MDF, PVC or polyurethane molding. PVC is most resistant to warping and dents but is not as decorative and has a slick surface that is not amenable to painting. It is generally used in bathrooms and exterior areas. Aesthetically, these materials may not give you the same effect as wood but you will not have to worry about infestations. Using two-part molding is another way to minimize separation due to temperature and humidity. With this method, the base of the molding is attached to the wall and the upper region is attached to the ceiling. This will help prevent the bottom part of the molding from separating from the wall even if the ceiling moves.